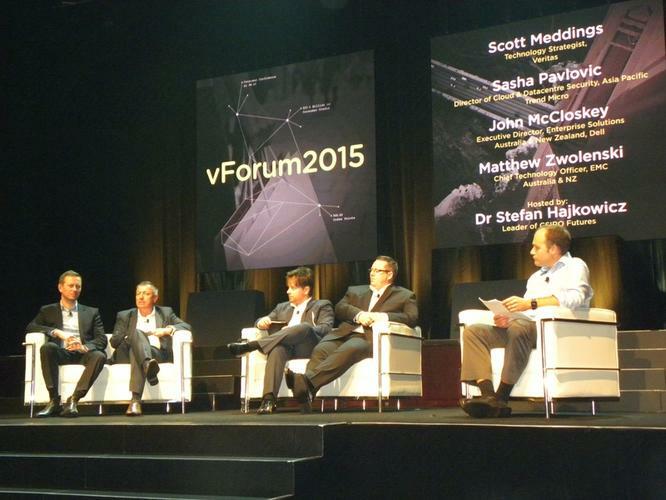 Cloud has brought about an automated future and since we’re at the end of the experimental phase of it, businesses need to prepare themselves for it, according to a panel of speakers that were at VMware’s vForum in Sydney. Dell A/NZ enterprise solutions executive director, John McCloskey, said automation needs a proactive rather than a reactive business model and in making the transition, businesses should be aware of the problems they’re trying to solve. “There are different ways to skin a cat so the services approach is one of the ways businesses can value add to the Cloud. That’s what we’re aiming to achieve at Dell. We’re trying to get a single pane of glass looking to an open management system that is scalable. But it’s about tapping into that while maintaining your governance and security,” he said. Veritas technology strategist, Scott Meddings, said part of that strategy starts from the datacentre. The ability to scale is a key aspect of it, alongside having an automated disaster recovery plan. “In the past, we had critical applications running and we would automate around them. What’s changed now is that we’re at the nexus to be able to provide automated disaster recovery across multi-Clouds, and we’re making huge investments to be able to do that. “But the first thing that we need to do to be able to automate successfully is to simplify and standardise. We need to pull the human element out of automation and let applications create profits,” Meddings said. Trend Micro Asia-Pacific Cloud and datacentre security director, Sasha Pavlovic, in a world that sees many start-ups born in the Cloud, there needs to be a shift in the way business is done even though it presents a number of challenges. “You might have infrastructure that is unable to support that type of deployments. It’s very difficult to scale these traditional appliances and technologies, and it’s impossible to lift and shift these technologies but it’s all about being agile, scalable and moving from a CAPEX to OPEX cost model,” Pavlovic said. EMC A/NZ chief technology officer, Matthew Zwolenski, added that with more customers moving towards the public Cloud, there are inherent risks in securing and protecting information. He indicated that’s why having a hybrid Cloud environment is important. Meddings elaborated on the CAPEX versus OPEX cost model. According to him, in the future, everyone will be purchasing using an OPEX model. “If I’m buying everything on an OPEX model, in the future, how do I reduce costs? The number one way to do that is reduce infrastructure or provide agility or reduce your data footprint. You also need to understand what value data brings to your company,” he stated. Pavlovic indicated security is an enabler for an agile software space and the thinking that it’s an inhibitor to tech advancement has passed. McCloskey mentioned businesses need to pause and work out their Cloud strategy blueprint for 2016. “Start by automating everything and create a bi-modal IT structure. Create an innovation team that specialises in digital disruption so that you can move into this new world of IT. That’s an important process to think about,” Zwolenski added. Meddings suggested standardisation and simplification is key in taking out the complexity of moving into an automated future as from this point forth, everything is going to accelerate at a faster pace. “It’s hard to predict what is around the corner but don’t be afraid to innovate. All we know is that there is a quick shift coming and we should make use of the smorgasbord of tools and technologies to bring us forward,” he added. Dell CSO: What do Mexican drug cartels, Romanian acrobats and a soccer dad all have in common?